Senator Jim Beall (D-Santa Clara), chair, addresses the special session of the Transportation and Infrastructure Committee. The California legislature held its first joint special session on transportation funding just before the holiday weekend. The session was called by Governor Jerry Brown when he and the legislature punted some big decisions so they could sign a budget before the June 30 deadline. The first extraordinary session of the Transportation and Infrastructure Development committee was an informational overview. Testimony from Caltrans and the Legislative Analyst’s Office reiterated what attendees mostly knew: that California roads are full of potholes, its bridges are in dire need of repair, and there’s nowhere near enough money available to pay for any of it. Democrats and Republicans have offered very different proposals for solving these problems, although there are a few things everyone seems to agree on. For example, that funds collected for transportation should be spent on transportation. And that voters will demand accountability on how any funds are spent. But where the much-needed funding should come from is not an area of agreement, and how it should be spent hasn’t even entered the conversation. Committee chair Jim Beall (D-Santa Clara) has proposed increases in the gas tax and vehicle registration fees. Assembly leader Toni Atkins (D-San Diego) has proposed a road-user fee. Republicans propose to divert money from high-speed rail bonds and use cap-and-trade funds to pay for roads. That would be worth a good laugh if they weren’t so serious about it. He had to be polite, because he is a politician. But he also has to be politic because his proposal to raise the gas tax, the only serious short-term solution presented so far, needs a two-thirds majority to pass. And that means it needs Republican support, even though that party’s members have been vocal in their opposition to raising any taxes. The first meeting of the special session focused on defining the problem (California’s roads, highways, and bridges are in bad shape) and its roots (unstable funding, decreasing effectiveness of the gas tax) and a little bit of who might be responsible (Caltrans has a huge, inefficient bureaucracy that wastes money—it’s working on that—and previous legislatures and administrations have raided transportation funding when money was tight). “It’s imperative to address the problem now,” he added, saying that he was open to discussion on other solutions. Briefly mentioned a few times in the course of the hearing was the idea, currently being explored by a special committee of the California Transportation Commission, for a road-user fee that would fairly allocate the costs of road repair to those who use the roads the most. Senator Tom Berryhill (R-Stanislaus) kept bringing up the question of accountability. “My concern is that over the years—Prop 42 pops to mind—we find loopholes,” he said. “What would prevent a future legislature, or governor, from borrowing any funds we raised? I don’t mind paying a tax if the money is going for what it’s supposed to be for, but so far we haven’t done that,” he said. California State Transportation Agency Director Brian Kelly agreed that sometimes “the past is prologue. We have used general fund sources to fund transportation, and in difficult times they have been pulled back.” He suggested the solution was to focus on a “user-based fee” to generate funds outside of the general fund, dedicated to transportation by statute and therefore not available for other purposes. 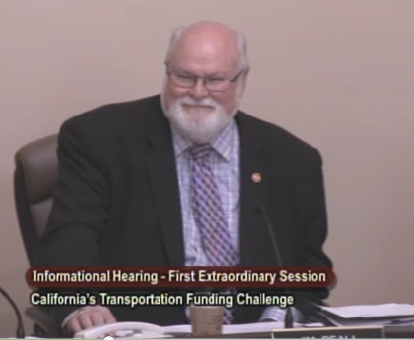 SBX1-1: Transportation Funding (Jim Beall, D-Santa Clara). This bill would create a Road Maintenance and Rehabilitation Program, to be reauthorized every five years, funded by a ten-cent increase in the gas tax and diesel tax, a $35 increase in annual vehicle registration fees, and a $100 registration fee for zero-emission vehicles. The bill would also redirect vehicle weight fees from paying for debt service on general fund transportation bonds and require the repayment of outstanding loans made to the General Fund from the highway account. It includes requirements to assure efficient and cost-effective project delivery, and requires a three percent increase in efficiency at Caltrans, with the savings going towards highway maintenance. SBX1-2: Greenhouse Gas Reduction Fund (Bob Huff, R-San Dimas). This bill would exclude from the GGRF any funds generated “from the transportation fuels sector” and apply them to transportation infrastructure, including public streets and roads, but excluding high-speed rail. SBX1-3: Transportation Bonds: Highway, Street, and Road Projects (Andy Vidak, R-Hanford). Another attempt at getting rid of high-speed rail, this bill would disallow the sale of any more high-speed rail bonds except for “early improvement projects,” with unspent proceeds to be used for retiring debt from the sale of any existing HSR bonds. It would also apply any future proceeds of bond sales to road repair and new road construction. ABX1-2: Transportation Projects: Comprehensive Development Lease Agreements (Henry Perea, D-Fresno). This bill would remove a sunset date on allowing Caltrans and regional transportation agencies to form public-private partnerships for toll facilities and the like.